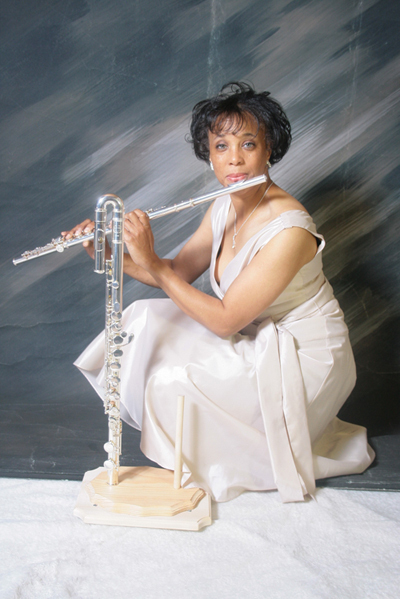 Elegant, classy, spiritual, and phenomenal flutist, educator, and entrepreneur are talents that describe Karen Daniels. A native of Waycross, Georgia, Karen Daniels generates energy and excitement everywhere she performs. Karen's extensive and diverse repertoire covers a wide range of genres from classical, jazz, Latin, gospel, and popular tunes, moving effortlessly from one repertoire to another. Karen has performed and toured in England, Germany, Italy, Switzerland and France with All-Student Groups, USA. She also toured Japan with an R&B group, Atlanta Connection Band (ACB) of Atlanta, Georgia. Karen has performed with the Mercer University Flute Choir, a jazz ensemble "Mystic", and was guest soloist and conductor with the Middle Georgia Concert Band, all of Macon, Georgia. Karen is currently an elementary and middle school Band Director in Savannah, Georgia. In 2010 she joined the Savannah Winds of Savannah, Georgia. She has also performed woodwinds in the musical "A Funny Thing Happened On The Way To The Forum" and "The Radio Hour" at the May River Theatre in Bluffton, SC. You may reach Karen Daniels at (478) 442-0613 or email Karen at k.daniels160@comcast.net.